Flower selection for hanging pots requires selection of plants that develop full foliage to fill the pot. The best choices often have trailing growth habits that extend outward from the pot rim. Choose flowers for hanging pots that have an appealing flower as well as attractive foliage. The best flowers for hanging pots include annual plants that last for a single season but provide extended blooms all season. Few plants grace a hanging planter as beautifully as the petunia. The lovely plants feature a wave-like growth that spreads foliage and flowers over basket edges. Petunias feature a cup-shaped flower that comes in a wide range of colors, including variegated strips and watercolor-like blends. The plant flowers consistently with regular deadheading to remove spent flowers. Gardeners typically use the grandiflora variety of petunias in a hanging pot. Grandiflora petunias have a cascading growth habit and feature large flowers. Multiflora petunias grow in compact bunches but provide more flowers than their grandiflora cousins. Both varieties work well in hanging pots due to the trailing nature of the foliage growth. 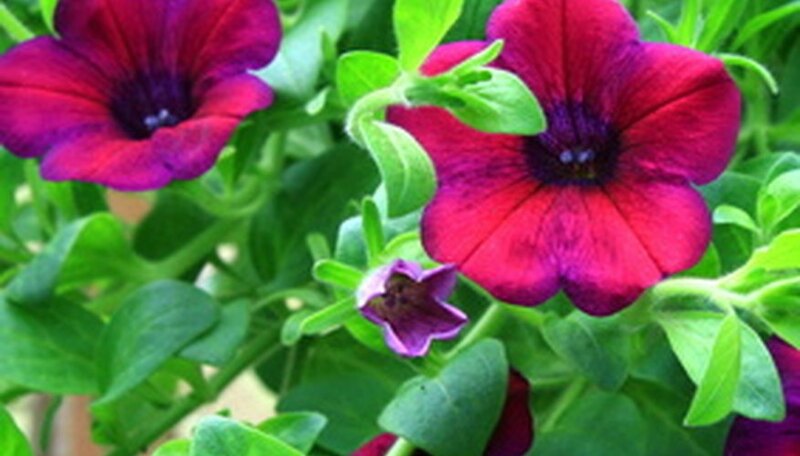 Petunias like full sun to partial shade with regular watering for best results. Apply fertilizer to the hanging pot once a month for continued bloom production. Lobelia has a mounding growth tendency that fills a hanging pot perfectly. This beautiful plant features bright green foliage with small purple to light-pink flowers, depending on the cultivar. Lobelia grows to about 6 inches tall and spreads in a trailing mat that will easily fill a hanging container. Plant lobelia in full to partial sun in good-quality potting soil for best growing results. Lobelia's five-petaled flowers resemble small butterflies when viewed against the backdrop of the bright green foliage. Lobelia grows to a width of about 12 inches and can be paired with taller plants in the hanging pot. Lobelia flowers until mid-summer and requires shearing to produce another round of blooms. Lobelia needs consistent watering and will not tolerate dry soil conditions. Geranium is one of the most beautiful annual container plants that provide continual blooms throughout the summer growing season. 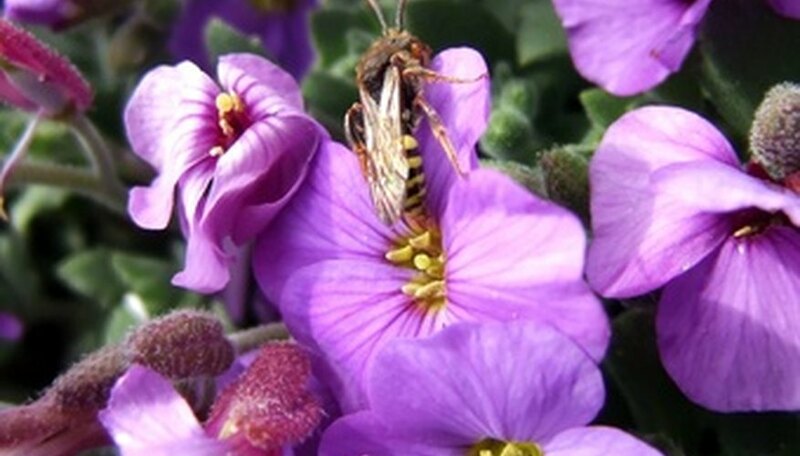 Ivy geraniums differ slightly from standard geraniums in the growth habit of the foliage. These plants have a pleasing cascade tendency that makes this type of geranium perfect for a hanging pot. Ivy geraniums have large round leaves in medium green and bright-colored flower clusters attached to long stems. Flower colors include red, lavender and pink. Ivy geranium prefers full sun to encourage continual blooms. These natives to South Africa also enjoy cool nights. Water the geranium when the soil is slightly dry and fertilize regularly to encourage full flushes of blooms. 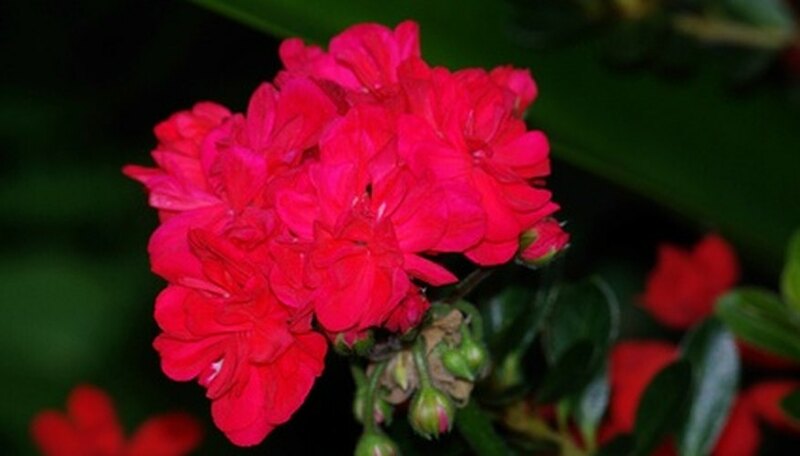 Avoid wetting the leaves with water-soluble fertilizers to limit burning of the beautiful foliage of the ivy geranium.